this summer is passing me by quite quickly. anyone else having a super fast warp speed summer too? we've had a great summer. we've relaxed, we've done some fun family stuff, and we've done a family vacation. which i'll show pictures of that soon too. i've worked on my new fall patterns at the pool, in the car, with a fish, in a dish...wait. hmmm. well the idea is that whenever a i do get a minute i've been doing some work that i can take with me anywhere i am and when the kids are all occupied. this summer i've made it a point to get a little bit of sewing done. not too much "work" related sewing, but more "just for me" sewing. and honestly it's not been that much but it's more than in the years past. here's my latest "just for me" finish. i decided that i could work here and there on a double point dresden plate. using my Dresden plate ruler i decided to just used the top part of the blade of the ruler. for the "double point" look you are going to sew the bottom part of the blade just like the top. continue with turning the points inside out and press with an iron. then just like the normal dresden plate, line up your raw edges. and sew those together. you end up with two finished edges on your dresden plate. for basting my wall quilt i used 505 basting spray . if you havent tried this you should. it's worth it and makes quilting a little easier on a home machine. next i drew my lines on my quilt. i wanted "X"s.
remember how i was saying i "worked" on stuff anywhere i could and many days it was at the pool. now i know what you must think...because i'm a quilter and i love quilts, that must mean i have quilts lining my walls, hung over couches, chairs and on quilt racks. mainly we just sleep under them and have them at the foot of our beds. i have them in baskets upstairs and downstairs and anywhere we have sitting places. but yeah not any of them are up on my walls in my main level area. i really like how simply color and simply style go well together. oh...and yeah. btw. simply style. is now available in a quilt store near you. :) and if it's not. raise hell that you want it. I happened to be in a shop last week and spotted the bolts of Simply Style still in plastic. Yes, I handled each one until I could decide on what would go home with me that day. They are beautiful Vanessa! Another job well done! Agreed on the super fast warp speed summer. Like way too super fast warp speed! Agree on the 505 - makes home quilting waaay easier on my Janome, who likes to push the top and bottom layers at different speeds. Love the spot you picked for your new beauty - looks perfect there! 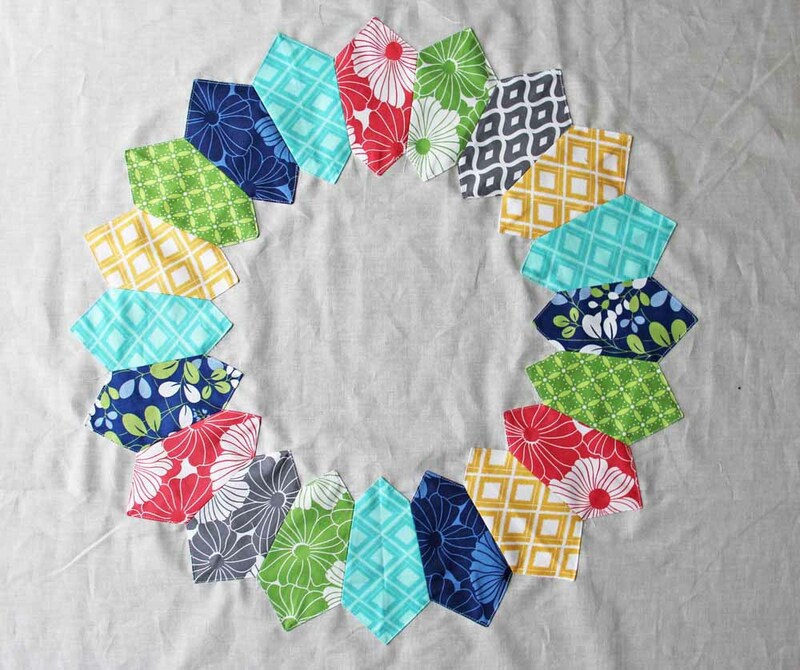 I'd like to make the double Dresden plate in X-Mass fabric like a wreath. Luv your new line of fabric...so hip! Lovely quilt! You're not alone in not hanging quilt. I've made 20 quilts so far and not one is hanging on a wall. I have a question about the 505 Spray--how many quilts do you think a can lasts? I've never used a basting spray and might be tempted to try it if I can find it on sale. 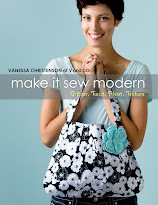 Btw, love the new line; I just picked up one of your purples at my local quilt shop! This looks great Vanessa! I love that photo with the kids in the background---a great shot! Happy Summer! 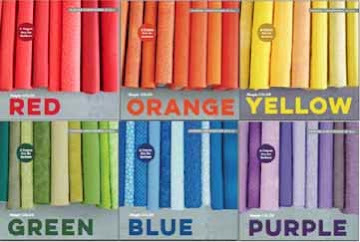 I'm making a quilt using these gorgeous fabrics !!! 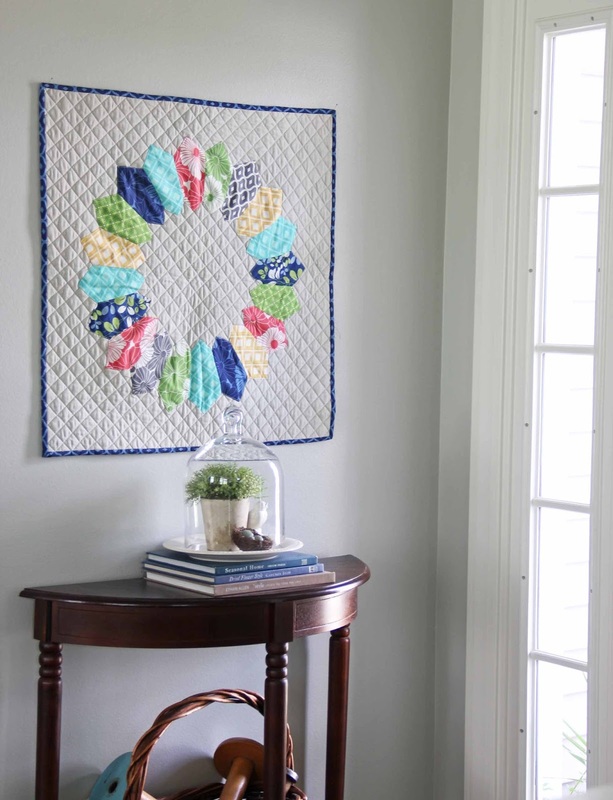 Love this wall hanging! Your new fabric line is beautiful! 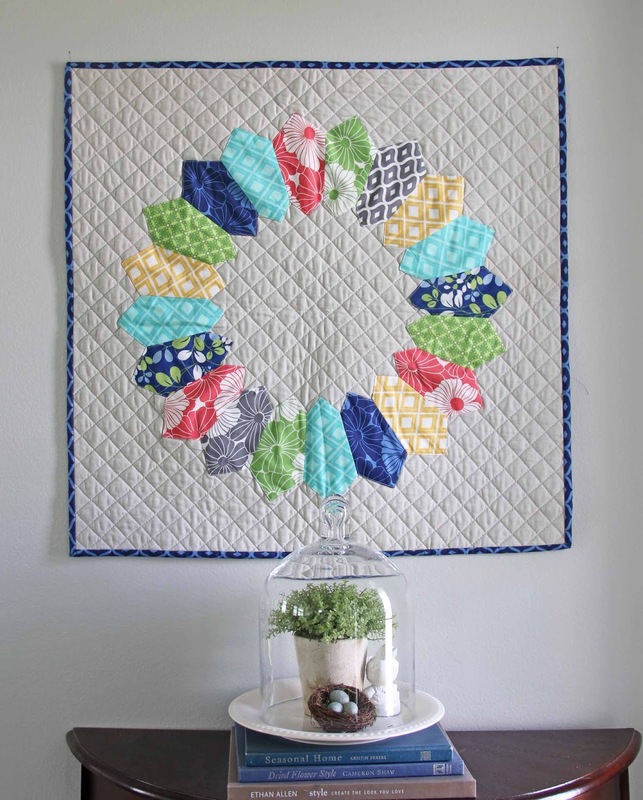 I really like the cross hatch quilting that you did, and that double-pointed Dresden plate is brilliant! I would never have thought to do something like that. I recently took a free motion quilting class (and no, I can't get the hang of it either! ), and they used the 505 Spray to hold the layers together. I was really happy with the results, so now I am spraying 505 anywhere I can! This is so pretty! I too like how the two lines work together. It's gorgeous! I love the pop of colors - you did a great job. Years ago I was told there are 4 things every room needs to be comfortable and look stylish: 1, green plant 2, mirror 3, books 4, a quilt. You just can't go wrong with a quilt! I love both your lines...been hoarding some Simply Color and now that Simply Style is out it's the perfect time to actually use it! I have a Bernina question, if you have time to answer. What foot do you use to sew your dresdens together? I just did one using my #57 foot (1/4" with a guide) and it turned out terrible! Like I was sewing a much smaller seam than 1/4", and ended up with far too much fabric. Thoughts? Foot error? Operator error? I'd love any advice! Lovely little quilt - dresdens are on my try one day list. 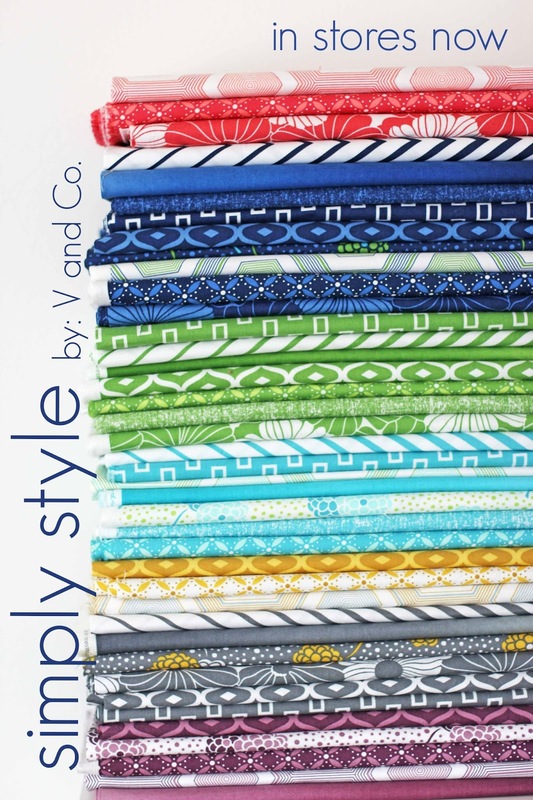 I have just Purchased a fat quarter bundle of Simply Style eyelet through SewLux - I don't know if I would see it in New Zealand for months otherwise. Have you tried bernina binding foot? I really like this quilt by your front door. Many years ago, I made a wall hanging for a friend who hung it in her foyer. When I saw it a few months later, I was shocked to see how badly it had faded. I became quite discouraged after that and stopped quilting. Fortunately, I got over it and began again. I like your wall hanging quilt. It's very pretty and simple. The colors all go well together. Darn. Don't I WISH there was a quilt store near me... at all! You'd think I live in the boonies, but 102,000 people live in our city. No quilt shop. What gives? Online ordering is the best option. Oh, and I'll endorse that 505 Spray and Fix. It's great. I sprayed it on batting in the carless garage, with the door open, and then took it into the house for layering. Where do you spray? Yes on Warp speed summer, Huh?! on sewing for me (tell my family I'm unavailable) and WOW!! love that fabric, something else to add to me "gotta get" list. There is no doubt that all of these quilts are looking so adorable, thanks for the sharing. I love your "I Heart your Quilt" and the double point Dresden Plate. Want to try both soon. Thanks. Love your "I Heart Your Quilt" and the Dresden Plate with double point.